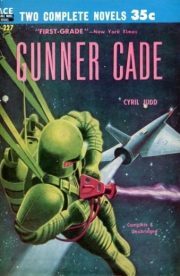 Gunner Cade is an SF adventure novel 1by Cyril Kornbluth and Judith Merril, originally published under the pen-name Cyril Judd. Wow, am I slow on the uptake … it’s just now I see how they came up with the pen-name. It is fitting that the Emperor rules. It is fitting that the Armsmen serve the Emperor through the Power Master and our particular Stars. While this is so all will be well, to the end of time. Gunner Cade believes this with every atom of his well-conditioned body. If not for the emperor and the unbending rules Cade and his fellow warriors serve, the world might fall back into the clutches of the Beetu-Nine, the Beefai-voh, and Beethrie-Six. Thanks to the selfless sacrifice of the Emperor, the world has been secure for ten thousand years. Cade is loyal to a fault and nobody can fault his determination to adhere to the rules. His imagination is sadly deficient, which is why it never occurs to him he should distrust the elderly commoner. So he quaffs the drugged drink she offers him. 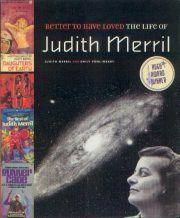 2002’s Hugo-nominated Better to Have Loved: The Life of Judith Merril is the posthumous autobiography of noted writer/editor Judith Merril. Merril having passed away in 1997, the work of turning Merril’s notes into a book fell to her granddaughter Emily Pohl-Weary. Better to Have Loved is also a forthright and frank reply to a few sanitized histories of science fiction published in recent years.